K.I.S.S. Crop-n-Shop Scrapbook Events: She's 7 today! Oh my gosh! Where did time go? Emma is 7 today and let me tell ya it's a BIG, MAJOR day for her!! She's been waiting for this day for a very long time. I've been trying to talk her into skipping it and staying 6 but she won't have anything to do with it!! She's ready to be seven! Honestly though, where did time go? I remember...the day I found out I was expecting a little girl. Stunned, scared, excited, nervous, thankful, grateful, blessed, so many emotions. I remember... the day I went into labor. I took a nap, woke up and told Greg we better get to the hospital. Just a few short hours later we had this stunning little creature in our arms. Boy was life about to change!! I remember... the night I was nursing her and she quit breathing. I know that my heart stopped at that moment and I went into auto pilot. After a hospital stay we came home hooked to an apnea monitor, hearts beating and scared out of our minds, afraid to sleep, listening for the beeping of the machine, feeling for her chest to rise and fall, rushing to the hospital several more times, cautious, careful...so very thankful that we still had her. I remember... the first time she took steps. We were at Nanny's house and I sat on one side of the room, Daddy on the other and she just started walking. She looked like a pro, like she had been doing it for years! Nanny clapping the entire time. sleeper, would smile for anyone, looked so darn cute in those girly outfits and bows! I remember... watching her and daddy dancing together as she wrapped him around her little finger! 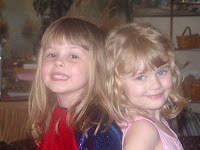 I remember... seeing the bond between her and Ryli grow into the most amazing friendship. I remember... the first day of school. I thought I would cry like I did with Tyler but she was so brave, so big, so excited! I remember...her sleeping in her Nanny's arms the night before she passed away. I remember how unaware, unafraid, how comfortable she was being there with her Nanny. Not scared of the machines, not aware of all the others in the room, not noticing the coughs from Nanny, not wanting anything but to cuddle with her Nanny. She just crawled right up there, over the machines, over the cords.... snuggled in Nanny's arms like she had done so many other times and fell asleep. 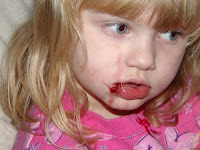 I remember how tough she is...stitches in her lip at 3, double root canals at 5, broken arm at 6, 6 teeth pulled at 6. Crazy tough, highest pain tolerance I've ever seen!! " Tougher than any boy", yet very girly girl!! I remember how blessed I am to have this little girl. She's amazing, she's mine, she's Emma and she's 7!!! Happy Birthday Emma Grace!! Love you! OH MY!!! Shannon, you had me almost in tears!!! Such a wonderful post! Of course, it made me think back to those times with my girls who are now 18 & 14 - it's a bit foggy!!! You have me crying over here! Give her a huge hug from all her TX "family"!